New Garden Room Extension to established rural Morayshire house. Mid Foresterseat was a previous winner of the prestigious Scottish Saltire Award for Architecture for the original conversion & extension. 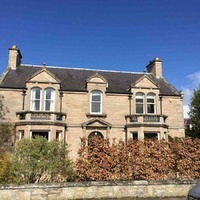 "We live in a fantastic location overlooking the Beauly Firth but our house needs a fundamental overhaul. Help!" What a great starting point for the modernisation and refurbishment of a 1980's bungalow. Extensions & Alterations to classic period villa with private walled garden in the heart of Nairn. Creation of new garden room, back door entrance, new shower room and re-oganisation of internal circulation spaces. A coastal cottage situated on the end of a Pier in Applecross, Wester Ross with views across the water to Skye. This traditional buildings' extension has undergone a slick over-cladding using zinc roofing and horizontal timbers to bring it up to date. 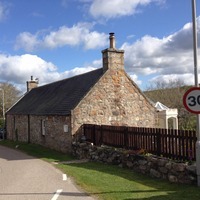 For rental information; Applecross Holiday Cottages. Alterations & Extension to old Mill buildings. Construction of new living accommodation for a young family. Energy conservation, insulation, re-glazing and integration of ground source heat pump heating system into the existing structures & the new build. Rennovation & Repair of traditional cottage, set on the hillside overlooking Drummuir Estate. Refurbishment & Internal Alterations to existing dwelling. Internal re-organisation, removing internal partitions and creating a new sunny, light kitchen with new back door entrance. Formation of new snug, utility and downstairs shower room. Modernisation, upgrading & extensions to two estate cottages in Moray. Building in provision for wood fuel heating system to be operated by the Estate. Extension and Alterations to semi-detached cottage in Edinville. Creation of new Living Room and entrance foyer. Provision of new dormers and upgrading of windows to No.10 Shore Street, Applecross. Set within the Conservation Area of Shore Street this small project hopes to put back some of the traditional charm to the main Street Elevation while also creating a new rear dormer to create first floor access to rear garden space. Bringing sunlight and space in to a traditional Findhorn Cottage. Opening up existing roof space to allow for new vellum roof windows to existing kitchen space and forming new sunroom porch. Sensitive addition of a new Front Porch in keeping with the traditional design of the period villa. Further extension to the rear wing of the dwelling (maintaining existing ridge heights) to provide north facing living & dining room. "We have a great location but please can you make our 1980's bungalow fit in with the character & style of Cawdor Village" This project involves the internal & external renovation of an existing dwelling in order to change is image, environmental performance and to provide contemporary modern styling. An amazing Baronial retreat yet built only 20 years ago. We were asked to design a new Barn and refurbish the outbuildings to provide a state-of-the art Log Boiler Heating system in order reduce running costs and ensure the environmental credentials for future generations. Is it Architecture ? Maybe not but it is a good project, worth doing and we were glad to help. Take a standard Miller Home and funk it up a bit to create a really special living space customised around the needs of the new owners. Design on a budget, something within the grasp of nearly everyone.